All Voyagers Toastmasters in good standing (up-to-date in paying their dues) are eligible to attend the District 5 Fall Conference at Liberty Station in Point Loma on November 1 from 7:30 am – 3:00 pm for FREE! To simplify the process, register and pay for the District 5 Fall conference by Sept. 30 using the link http://www.d5tm.org/lace. Send Jerry Marino your confirmation or receipt and he will reimburse you or credit your Voyagers account (your choice). We are using our scholarship fund to pay for this and want to afford as many Voyagers as possible the opportunity to attend for free! But you must register by Sept 30 to take advantage of the early bird discount and for Voyagers to reimburse you for that. All Voyagers (dues paid) members are eligible…which means if you register you should also pay your dues very soon if you haven’t yet! In fact, you could receive a credit for your dues by registering now. How can you beat that offer? There is never a shortage of people looking to better themselves, thus bettering their situation. Thursday Sept. 25th marked the first weekly meeting of the 5 week Toastmasters ‘Speechcraft’. Lynn and Carol have jumped right in and will give speeches next week while Rick is on the schedule for the following week. Michelle, Coco, Bernie and Delores round out our Speechcraft participants. There is still room for one more. If you know of someone that is on the fence, feel free to encourage them to join us next Thursday, October 2 at 7:30 am for our next meeting. Aside from our meeting being an amazing example of what a Toastmasters meeting can bring to it’s members, our three speakers all focused on topics aimed at the new speaker. Jerry Marino – Fear of speaking to a group, Terry Hewins used a Powerpoint presentation and a handout on how to choose a topic and Jane Diaz gave a VERY FUNNY ‘Icebreaker’ speech as an example for those giving icebreakers next week. Best Topics: Bernie Locsin- Wahoo, our new Speechcraft participant! Best Speaker went to Terry Hewins! Congratulations and we will see you next Thursday. On Saturday November 15 from noon to 4 p.m. join us in a walking food tour of Downtown San Diego and Little Italy. The tour will be led by our very own fellow Voyagers Toastmaster Jane Diaz, who is a professional food tour guide with Bite San Diego, where she puts her Toastmasters and Improv skills to good use. Jane (a.k.a. Juana) will entertain us with stories about colorful characters from San Diego’s history as we enjoy a leisurely 2 mile walk in a 4 hour time span and taste food at 5 different restaurants! The tours are limited to 17 participants, and at $45 per person (minimum age 21), tours sell out quickly. Please contact Cynthia Paloma if you plan to attend, but to simplify matters reservations are on your own. Bring a friend! Last week’s meeting was a good one. The theme was “Looking Forward” and the word of the day was “Tenacious.” A moment of silence was observed in remembrance of those who fell on this day in 2001. We heard from both Amy Gilstrap and Joji Peters. Amy is working out of the Advanced Communications Manual while Joji, a relative newcomer, is ticking off the speeches out of the Competent Communicator Manual. Both speeches were outstanding and gave the rest of us food for thought. Jane Flaherty, our Toastmaster demonstrated her prowess at crisply emceeing a meeting. We started and ended on time with a very full schedule. Make sure you come Thursday at 7:30 am. Our Toastmaster will be John Shannon. The theme of the meeting will be “Up” – You won’t want to miss it! Voyagers will be starting a 5 week Speechcraft Program on Thursday mornings from 7:00 – 8:30 a.m. starting September 25, 2014 through October 25, 2014. 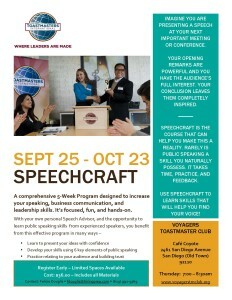 Voyagers Toastmasters (http://voyagerstmclub.org/) will hold a Speechcraft Workshop open to anyone interested in improving their public speaking and communications skills. The Speechcraft workshop will be held Thursday mornings from 7:00 – 8:30 AM and runs for five consecutive weeks starting September 25, 2014 through October 23, 2014. Sessions will be held at the Café Coyote Restaurant, in Old Town, 2461 San Diego Ave, San Diego CA 92110. The cost of the workshop is $36 and includes all materials. Speechcraft is a series of short, practical sessions in public speaking for those looking to overcome anxiety or to improve communication skills. Attendees will be a part of a learning, supportive and friendly environment. This will also be an opportunity to meet new people, network, while learning about Toastmasters International educational programs (http://www.toastmasters.org/). The interactive sessions will include Table Topics, which will allow attendees to give impromptu speeches on various topics. In addition to the opportunity to practice speaking, attendees will hear impromptu and prepared speeches from Voyager Toastmasters (http://voyagerstmclub.org/) members. The speaking and listening skills developed during Speechcraft help develop attendee confidence in both social and career speaking situations. Speechcraft participants may apply their workshop fee towards Toastmasters membership, and any speeches performed during that workshop will also count towards advancement in the Toastmasters Program. For more information and to sign up – contact Felicia Douglis, fdouglis@hiringprep.com, (619) 992-9369.